Right?!? 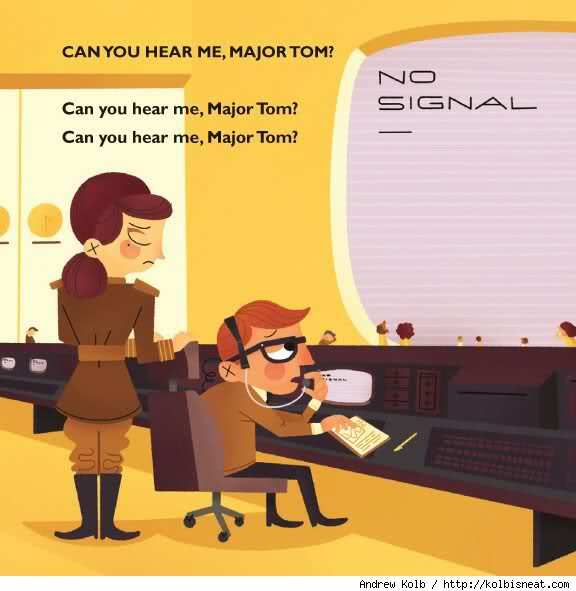 Kolb’s 60s “This is ___“-style illustrations somehow give the already dire lyrics more dramatic heft than they had on their own, especially when it comes to Major Tom’s wife (who in this instance appears to work at Ground Control). Your husband just lost communication with the natural world! Happy Labor Day! Read the book in its entirety here, if you have the strength. Now two instances is still one shy of a trend, but what’s the point of a pop culture blog if not to promote exaggerated, unfounded theories? And so we ask: does all this 2011 Major Tom-ness have something to do with the halting of NASA’s space shuttle program? And also a pervasive feeling, nationwide, that we’re just floating in a tin can (Honda Civic) with no control over our own professional destinies, hopelessly watching life march ever on far below? …Something to chew on at your BBQ tomorrow! This entry was posted on September 4, 2011 at 10:46 am and is filed under Editors' Picks, Junk Drawer, Music. You can follow any responses to this entry through the RSS 2.0 feed. You can leave a response, or trackback from your own site.